Throwing a dinner party is like learning to ride a bike. With practice, you get over that initial shakiness and stop worrying about crashing and (literally) burning. I have plenty of practice, so it's not often that I am wracked with uncertainty about dinner parties. But then my friend Casey and I made plans for dinner on a Wednesday night and I had no clue what to serve. But cooking for her? It's a little nervewracking. It's not that I was worried about making something she wouldn't like, because we have very similar taste in food. She gets just as excited about negronis and pimiento cheese and lemon desserts and rustic pasta dishes as I do. It's a pretty solid foundation for a friendship. I had dinner party block because nothing I thought of seemed worthy enough, or interesting enough, or special enough to merit this special person traveling out to Brooklyn after a long day at work. I mean, Mabel knows a few party tricks (mainly jumping and licking), and Dan and I are pretty good conversationalists, but I needed a good meal to make it worth her trip. Earlier that week, a copy of Hugh Acheson's new cookbook, A New Turn in the South came across my desk at work. As I leafed through it, I immediately felt connected to the recipes and images. Although real southerners do not count South Florida as part of the south, I have a soft spot for southern food and people. And Acheson's recipes sound so mouthwatering: pickled shrimp, fried okra salad with heirloom tomatoes, arugula and green goddess dressing,bacon-wrapped fennel-stuffed trout with hot-pepper vinaigrette, sweet tea creme brulee. The soup was easy enough to make. I simmered the ham hock in chicken stock and the usual carrot-celery-onion combo, then added collard greens, tomatoes, thyme and black eyed peas. As the recipe instructed, I removed the hock and attempted to remove the pink meat underneath the thick layer of skin. Unfortunately, this only yielded a few shreds of meat and me cutting my index finger with a fat-slicked knife. Something Casey would not do, I am sure. Nevertheless, the soup was very tasty. It had a definite porkiness, even without the actual pieces of pork. 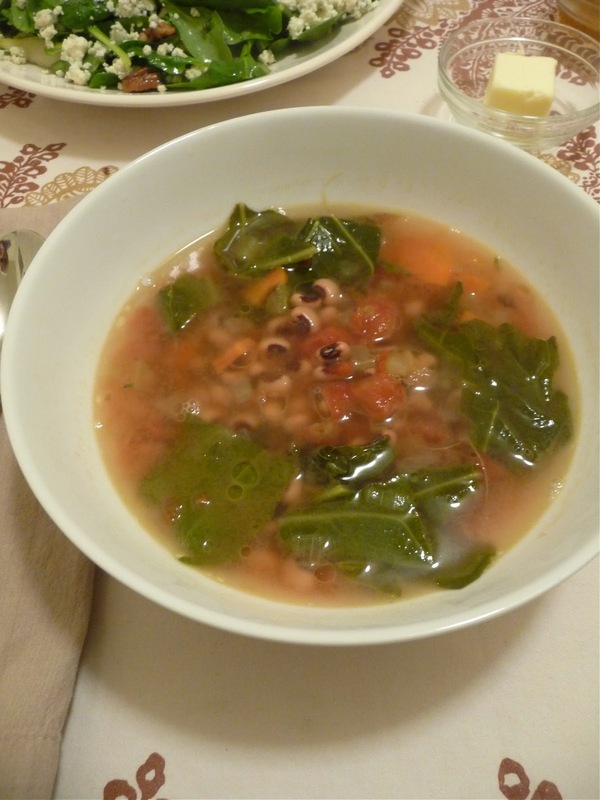 We didn't mind though, because the collards were deliciously tender and the tomatoes and beans gave the soup plenty of body. Served with corn muffins, homemade pepper jelly, and a salad of spinach, pecans, pears and a lemony-thyme vinaigrette (also from the book), it was a fine meal. The next day, I got an email from Casey saying that it was a luxury to have a meal prepared just for her. Which got me thinking about cooks, especially cooks like Casey. When you take such pleasure in feeding people, you're rarely the person being served a home cooked meal. It doesn't even matter what's on the menu, it's about being a guest, and not having to stir the pot, or set the table, or sweat about what you're serving for dessert. Although that stuff is fun too. Adapted from A New Turn in the South. The original recipe calls for mustard greens, which I could not find, but collard greens (or any other type of sturdy greens) worked out fine. 1 smoked ham hock, about 1 lb. Place a 4- to 6-quart soup pot over medium heat and add the butter. When it is melted, add the onion, carrot and celery and cook for 10 minutes, stirring occasionally. Add the garlic, black-eyed peas (if using dried), chicken stock and the ham hock. Cook until the peas are tender, about 1 hour. Skim off any white bean matter that floats to the surface. Remove the ham hock and set aside. Add the thyme, greens, black-eyed peas (if using canned), tomato and salt to the soup. Cook for 10 minutes. Remove any meat from the ham hock, chop it, then add it to the soup. Ladle the soup into bowls and garnish with a drizzle of olive oil and a few drops of vinegar (or lemon juice). I like the first half of your title best. The second part can be fill-in-the-blank....like brussels sprouts? Do other animals have hocks? You never see turkey hocks or goat hocks in recipes. Well, gee. Now you made me cry just a little bit with this post. My Grinchy heart grew three sizes! Also, Mabel's party tricks are ADORABLE. She can sit her cute hocks (haunches? flanks, in the parlance of Party Down?) on me anytime.